The world waited for over three months for the final results of the presidential elections in Afghanistan. After the second round (held on June 14, 2014) certain consternation appeared in the country, as Abdullah Abdullah, who after the first round of the election won a decisive advantage over Ashraf Ghani, announced that he would not accept any possible defeat. The candidate insisted that Ghani’s victory would be the result of mass forgery. Both the outgoing President Hamid Karzai and the U.S. Secretary of State John Kerry engaged in mediation between the two. Kerry proposed the separation of powers and the creation of a national unity government, in which both candidates would occupy nearly equivalent functions. While the talks dragged between the two concerned about the shape of the agreement, the tension and the threat of ethnic conflict was growing in the country. It was only with the signing of an agreement regarding the shape and distribution of power that a winner of the elections could be announced. Ghani became the new President of Afghanistan with Abdullah as the head of the government. Afghanistan – will history repeat itself? At the turn of the 1990s, the Afghan mujahedeen, with the support of the West, first forced Moscow to withdraw its troops from Afghanistan and then overthrew the communist government of Mohammad Najibullah. After thirteen years of guerrilla warfare and the complete destabilization of the country, the chance finally arose for Afghanistan to regain peace and establish its own independent authorities. The government of Rabbani and Massoud was in fact created, but it appeared immediately that other prominent commanders of jihad, who had fought against the Red Army, and who came from different ethnic groups, also wanted to gain power. Alliances, betrayals and the constant struggle among Massoud, Dostum, G. Hekmatyar and other commanders, devastating the country in the process, lasted until 1996. During this period, the country, deprived of government, suffered from spreading lawlessness. Therefore, with high public support and with no major problems, the Taliban, inspired by Mullah Mohammad Omar, captured Kabul. A period of Sharia rule began with its extreme fundamentalist interpretations. The time of the Islamic Emirate, established by the Taliban, resulted in, above all, religious and ethnic intolerance and growing hostility towards the West. This hostility resulted in support for the emerging concept of global Islamic terrorism. Reminding oneself of the events of the preceding two decades is of vital importance in the context of the current situation in Afghanistan. It has been thirteen years since the terrorist attacks of September 11, 2001, which led to the U.S. intervention in Afghanistan, the removal of the Taliban from power, and the commencement of the global war on terrorism. The completion of the ISAF mission is planned for 2014. The circumstances of its termination and the period when the Soviets left Kabul have a lot in common. Although the outgoing President Hamid Karzai underlined that he is leaving his successors “a hundred times stronger apparatus of power” than it would have been a few years ago, each day Afghanistan faces acts of terror and fights between government forces, Taliban fighters and other insurgent organizations. The Afghan army (ANA) and police (ANP) are engaged in fierce battles with anti-government forces and the future of the country still remains difficult to predict. Presidential election – a victory or defeat for Afghan democracy? the pressure of Washington, it can be concluded that the condition of Afghan democracy is still weak. Importantly, contrary to earlier predictions, it is not the society that has failed in this regard, but politicians and institutions. Abdullah, who in the first round won 45 per cent of support, was convinced that the high advantage over his rival, who received 32 per cent of votes, would be enough to ensure him the presidency. Then, however, the Afghan ethnic factor set in, which appealed to the reason of voters, politicians, and even the international community. Politicians, the media and citizens began to fear a situation in which the candidate representing the ethnic minority, Afghan Tajiks (although he himself is half Pashtun), would become the head of state. Mobilisation was powerful in the Pashtun south, and before the second round more polling stations were opened on the territory previously considered dangerous. After the announcement of the preliminary results, Ghani (a Pashtun) gained 56.44 per cent winning a definite advantage over Abdullah (43.56 per cent), and was therefore confident of his victory. However, this situation strongly strained Abdullah’s trust in the Independent Electoral Commission. He said that the elections were rigged and he would not accept their outcome. This is how a “post-election campaign” began in Afghanistan, which threatened bloodshed and armed clashes between Pashtuns and Uzbeks, who mostly stood behind Ghani, and Tajik and Hazaras, who supported Abdullah. After accusations of forgery an audit of all votes started. However, this process also quickly began to give rise to controversies on both sides. After U.S. Secretary of State John Kerry’s visit in Kabul in August 2014, the candidates initially agreed to a compromise: a separation of powers and the joint formation of a government. However, shortly after his departure, the dispute flared up again about who would be a stronger figure in the government. Under such circumstances, the announcement of any result seemed to be associated with the risk of the outbreak of serious rioting. Finally, the breakthrough came on September 20, 2014, when the voices of the agreement appeared between the candidates for the sake of the state and the nation. A day later Ghani was announced as the winner. 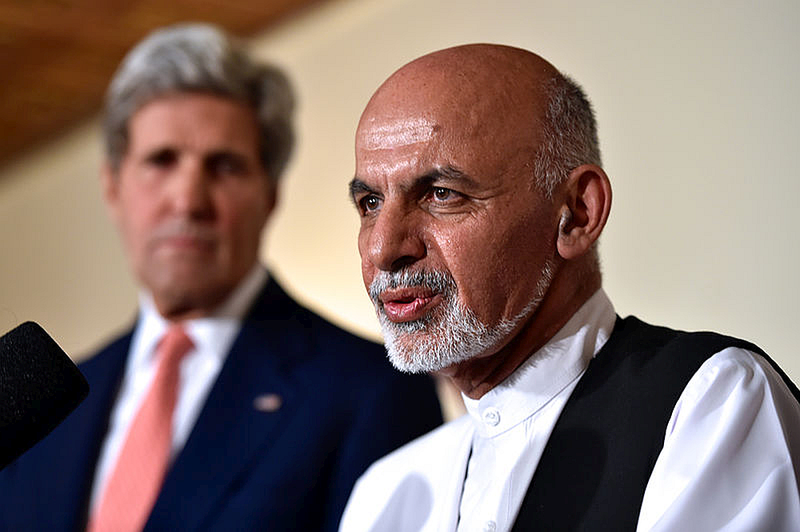 What will Ghani’s rule be like? The presidential system, adopted in the Islamic Republic of Afghanistan, will undoubtedly be weakened in the face of this agreement. Abdullah will hold the function of the chief of executive power, which would be close to the function of the Prime Minister. All the candidates for vice-presidents from both Abdullah’s and Ghani’s side can count on important positions in the new government. In this way prominent members of the largest ethnic groups in Afghanistan will be present in the government. This perspective seems to be beneficial. In the current situation the introduced solution seems to be the only possible peaceful solution, and may eventually lead to an equitable distribution of power. On the other hand, in the worst case scenario, the division of power may lead to the creation of two competing factions at the highest level – factions trying to impose their own initiatives and block opponents. All depends on the true intentions and the development of the relationship between Ghani and Abdullah. What is important for the West here is that the first announced step of the new cabinet is the signing of a strategic agreement with Washington under which after 2014 a ten-thousand strong American contingent will remain in Afghanistan. Both Ghani and Abdullah have been unanimous on the necessity of signing this agreement (previously rejected by President Karzai). Another priority, announced by Ghani, is the fight against corruption, which, as post-election events have shown, is an important concern for the stability of the Afghan state. the entire region. Afghanistan is a country divided internally; therefore, in the next few years, programs should be implemented which will build national unity across ethnic and religious divisions. Equally important is supporting the fight against corruption in Afghan institutions, something best demonstrated during the post-election events. Afghanistan needs a partnership approach from the West to be able to build its own economy, and to gradually limit the need for international assistance. Islamic extremism is still a huge threat in Afghanistan; it often breaks out in areas subject to ethnic conflicts. Afghanistan and its surroundings should be monitored in order to avoid a situation similar to the one taking place in Iraq. The post-election stalemate revealed the weakness of Afghan institutions and the scale of the problem of ethnicity in Afghanistan. Despite the agreement, the situation in the Hindu Kush remains tense and, in the event of escalation, may easily evade the control of government forces. As a result of ineffective cooperation between Abdullah and Ghani, anxiety might escalate, especially after the exit of the ISAF troops from Afghanistan, which will create opportunities for the offensive of the Taliban militants. The introduced democracy model, though apparently not negatively perceived by the citizens, in its current shape does not lead to a fair distribution of power and satisfactory public governance. The concept of ethno-religious key still needs to be improved. Perhaps, the recently implemented concept of a national unity government, with the leading role of the two politicians, will be more appropriate to the ethnic and political reality in Afghanistan, than a formal presidential system. Only Abdullah’s and Ghani’s common sense and awareness of threats may reassure Afghan society, whose unity must be ensured in the near future. Both politicians have proved that they can come to a compromise and stand above particular interests, which should be viewed positively. However, the coming years of their joint rule will abound in situations certain to test the reached agreement.